Jianhua Hao*, Yang Zhang, and Xianhua Wei, “Electric-induced enhancement and modulation of upconversionphotoluminescence in epitaxial BaTiO3:Yb/Er thin films”, Angew. Chem. Int. Ed., 50, 6876 (2011). Yang Zhang, Guanyin Gao, Helen L. W. Chan, Jiyan Dai, Yu Wang, and Jianhua Hao* “Piezo-phototronic effect induced dual-mode light and ultrasound emissions from ZnS:Mn/PMN-PT thin-Film structure”, Adv. Mater. 24, 1729 (2012). Zhibin Yang, Wen Huang, and Jianhua Hao*, “Determination of band alignment of pulsed-laser-deposited perovskitetitanate/III-V semiconductor heterostructure using X-ray and ultraviolet photoelectron spectroscopy”, Appl. Phys. Lett.103, 031919 (2013). 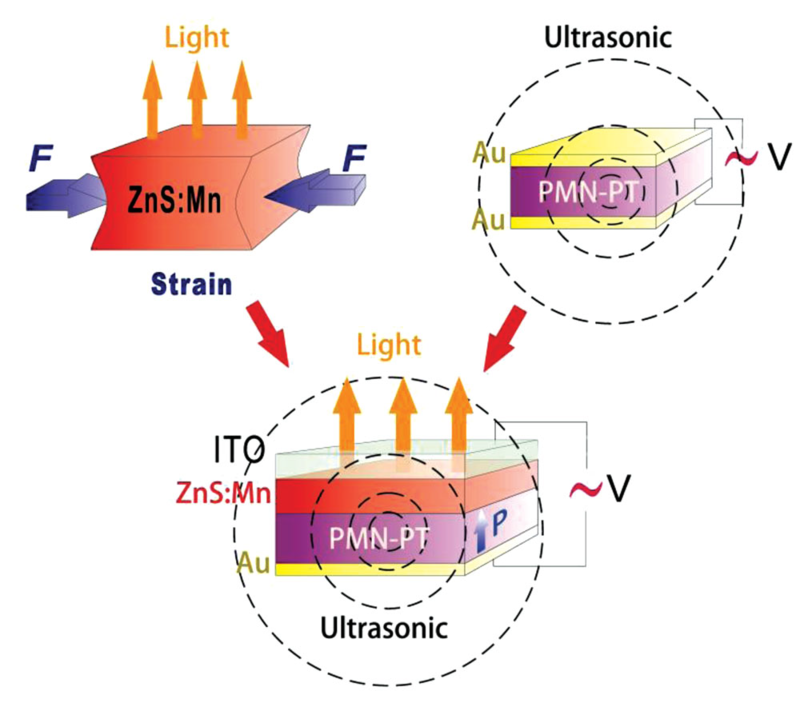 Gongxun Bai, Yang Zhang, and Jianhua Hao*, “Tuning of near-infrared luminescence of SrTiO3:Ni2+ thin films grown on piezoelectric PMN-PT via strain engineering”, Sci. Rep. 4, 5724 (2014). 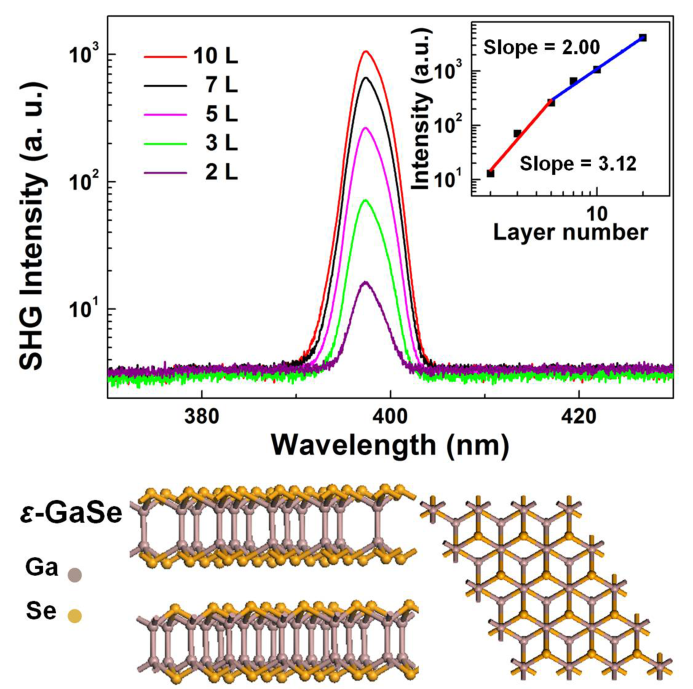 Wenjing Jie, Fengang Zheng, and Jianhua Hao*, Graphene/gallium arsenide-based Schottky junction solar cells, Appl. Phys. Lett. 103, 233111 (2013). Wenjing Jie, Yeung Yu Hui, Yang Zhang, Shu Ping Lau, and Jianhua Hao*, “Effects of controllable biaxial strain on the Raman spectra of monolayer graphene prepared by chemical vapor deposition”, Appl. Phys. Lett., 102, 223112 (2013). 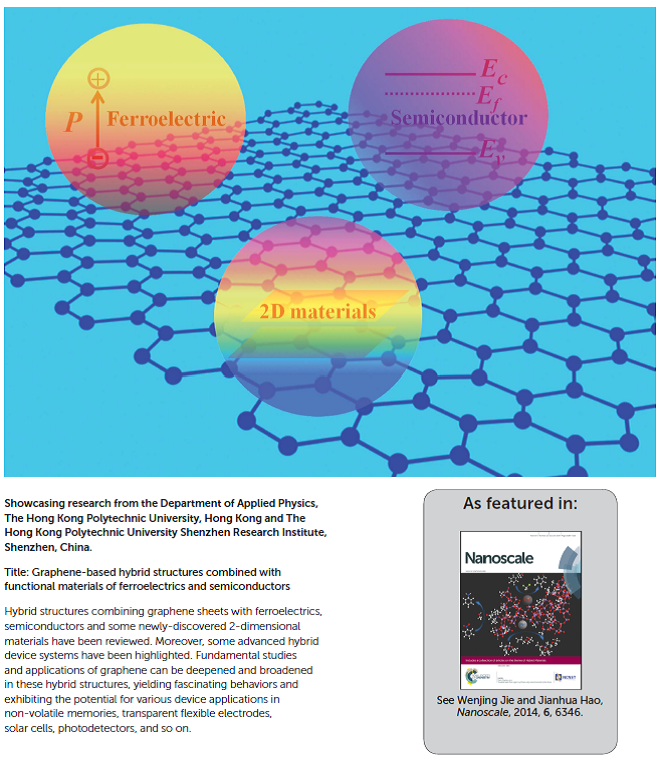 Wenjing Jie and Jianhua Hao*, “Graphene-based hybrid structures combined with functional materials of ferroelectrics and semiconductors”, Nanoscale 6, 6346 (2014) (Invited Review, Featured in Outside Back Cover). Wenjing Jie, Xi Chen, Dian Li, Lu Xie, Yeung Yu Hui, Shu Ping Lau, Xiaodong Cui, and Jianhua Hao*, “Layer-dependent nonlinear optical properties and stability of non-centrosymmetric modification in few-layer GaSe sheets”, Angew. Chem. Int. Ed. 54, 1185 (2015). Zhibin Yang, Jianhua Hao*, Shuoguo Yuan, Shenghuang Lin, Hei Man Yau, Jiyan Dai, and Shu Ping Lau*, “Field-effect transistors based on amorphous black phosphorous ultrathin films by pulsed laser deposition”, Adv. Mater. 27, 3748 (2015).